For some people the big contest of May 2010 will be the UK elections, but others have their eyes elsewhere: on a competition full of passion, public votes and glittery tights – the Eurovision Song contest. And while everyone’s been twittering on about election-this and gordon-brown-that, the good folks over at Simu Soft have been working away producing an iPhone app that will make the Eurovision song contest better for us all. 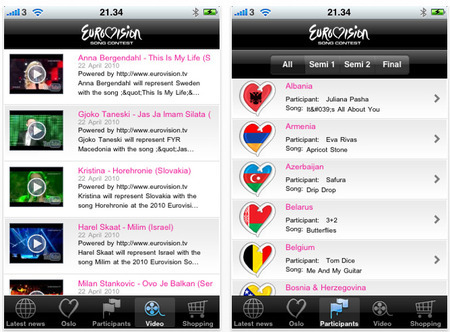 As far as I can see, it’s the only free app for the Oslo 2010 Eurovision competition and while I wouldn’t actually pay for it, this is going to be a useful reference point for those pre-Eurovision conversations and invaluable while watching the actual competition. It lets you read a stream of latest news about the Eurvision song contest, check historical facts about it, see stuff about host city Oslo and my favourite bit: gives you pictures, videos and a little bio of the main competitiors. And if you want to shell out you can buy each of the songs submitted to the competition from iTunes. It’s nice, clear and informative as apps go – simple design and lots of info packed in, but I don’t think it truly captures the spirit of the whole thing. I know, they couldn’t really get Terry Wogan to write it, but I would have liked a bit more razzle, dazzle and Eurowackiness.